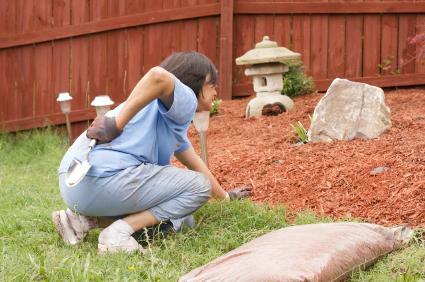 Do You Get Back Pain While Doing Yard Work? Follow These Steps! Avoiding back pain and knee pain while doing yard work is very well possible! Springtime is almost here, which means many of us are planning to be outdoors, fixing up our backyards, planting and watering new vegetation and moving that old patio set out of the shed. Working in the yard and garden can mean using muscles and moving in a way that is atypical of your normal daily routine. Avoiding pain of any kind when working in the garden takes effort. Your NJ physical therapist at Elite Spine and Sports Care will be a valuable resource in helping you prepare your body for taking care of your yard! Why Is Yard Work & Gardening So Hard On The Body? Repetitive movement or prolonged positioning of the body can strain muscles, joints, and ligaments. When working in your yard, you’re often sitting in one spot, kneeling for extended periods, placing pressure on knees and other uncomfortable movements. Repetitive movements such as shoveling, pulling weeds or even using hedge clippers can cause strain on various muscles and ligaments. Prepping your muscles and working on posture are a couple of things that can help ease the pain caused by hours of yard work. Of course, how many people actually physically prepare for yard work? Believe it or not, yard work is exercise! It involves poses, stretches, moving, and lifting. You train and prepare for a running race or a tennis tournament but perhaps not for planting and pruning. Stretch – Stretch before you start, during, and after you are finished. The more you stretch the more limber your muscles and joints will be. Don’t stay in one position too long – You can finish two jobs by taking breaks and alternating between the two (or three or four). Sitting in one position too long while weeding can do a number. Mix it up! Use Knee Pads – Knee pads or gardening pads are great for providing relief to your knees when kneeling. Plus, it keeps your knees clean! Paying attention to your alignment, posture, and muscle development is helpful for day to day living, including with preparing for a summer of yard work. Take the time to treat your body well and help avoid the aches and pains that go along with summer work and play. Our NJ physical therapists can help you prepare for activity as well as ease pain resulting from physical activity. Contact our team at Elite Spine and Sports Care today. Our educated, experienced, and knowledgeable physical therapists can help you prepare for yard work and help you avoid pain and injury. If it is too late to prepare, then our team of Northern New Jersey Physical Therapists can help you address the areas of pain and get you back to landscaping & gardening in no time.